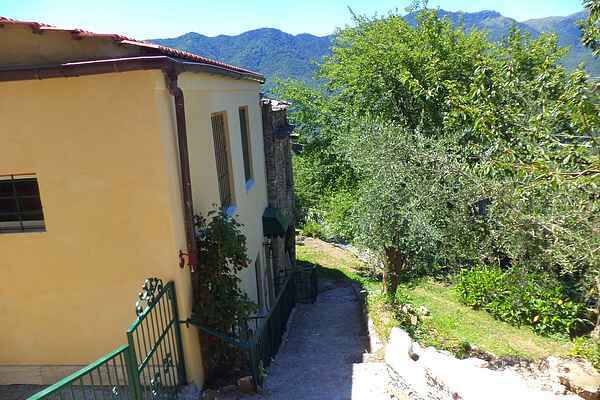 Located in Guagnolo, which makes up part of Stellanello village, Ca' d'Artista is a Ligurian farmhouse. The village extends along the ridge of the hillside and appears to be suspended among the olive and lemon trees. Lavender, thyme and rosemary fragrance the air when they are in flower. Old ruins, covered with ivy which thrives among the old stones, provide a romantic and distinctive atmosphere. Inside, the house is daubed in yellow, with a beautiful climbing rose. It can be accessed from the main street, via a section of olive grove and benefits from private parking very close to the house. It is set out over two floors and the rental apartment is located on the ground/first floor, depending on where you are looking from. From the living room, guests can reach the terrace/garden, with a small gate which leads on to part of the olive grove. This terrace affords beautiful views over Val Merula with a plethora of small villages, similar to nativity scenes suspended on the hill tops, with the sea in the distance. A shady area for outdoor dining and a BBQ make this outside area very pleasant, fresh and breezy.